proceeds from the sale of these ornaments to fund cancer research. limited numbers of 999 ornaments of each design, for the discerning collector. The first snowflakes danced outside, and everything was quiet in the street. It was Sunday, the first day of Advent, "Hurray," Hannah exclaimed, "I love to play in the snow." Her friend Paul suggested, "Here we can build a snowman." They quickly hurried into the garden. The body of the snowman consisted of two big snowballs, the eyes and the mouth of old coals, the nose of a carrot, and on the head was a old pot. "Somehow he looks like he's cold." Paul said, "He needs something warm to put on." Hannah ran back into the house and returned with a thick scarf she put around the snowman;s neck. Both agreed: "Perfect." Before they went back into the house to warm themselves, Paul gave Hannah a soft kiss on her cold cheek. These ornament has been created with the new & innovative Life Touch painting technique! Each ornament comes with a distinctive gift tag and individually packaged in an Inge- glas Premium Silver Collectors Box. 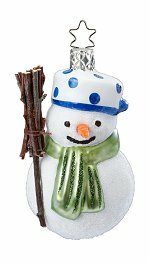 Made in Neustadt, Bavaria, Germany by Inge-glas® Manufaktur 2018 Introduction 4-3/8 inches - 11,0 cm Limited Edition: 999 pieces All Three Ornaments in individual boxes! New - Now in Stock! The first snowflakes danced outside, and everything was quiet in the street. It was Sunday, the first day of Advent, "Hurray," Hannah exclaimed, "I love to play in the snow." Her friend Paul suggested, "Here we can build a snowman." (Story continues...) This ornament has been created with the new & innovative Life Touch painting technique! This ornament comes with a distinctive gift tag and individually packaged in an Inge- glas Premium Silver Collectors Box. Made in Neustadt, Bavaria, Germany by Inge-glas® Manufaktur 2018 Introduction 4-3/8 inches - 11,0 cm Limited Edition: 999 pieces New - Now in Stock! ... Hannah and Paul quickly hurried into the garden. The body of the snowman consisted of two big snowballs, the eyes and the mouth of old coals, the nose of a carrot, and on the head was a old pot. "Somehow he looks like he's cold." Paul said, "He needs something warm to put on." (Story continues... ) This ornament has been created with the new & innovative Life Touch painting technique! This ornament comes with a distinctive gift tag and individually packaged in an Inge- glas Premium Silver Collectors Box. Made in Neustadt, Bavaria, Germany by Inge-glas® Manufaktur 2018 Introduction 4-3/8 inches - 11,0 cm Limited Edition: 999 pieces New - Now in Stock! Now with the snowman built, Paul said, "He needs something warm to put on." Hannah ran back into the house and returned with a thick scarf she put around the snowman's neck. Both agreed: "Perfect." Before they went back into the house to warm themselves, Paul gave Hannah a soft kiss on her cold cheek. 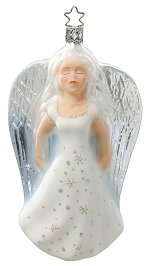 This ornament comes with a distinctive gift tag and individually packaged in an Inge- glas Premium Silver Collectors Box. Made in Neustadt, Bavaria, Germany by Inge-glas® Manufaktur 2018 Introduction 3-1/2 inches - 9,0 cm Limited Edition: 999 pieces New - Now in Stock!